It is a piece about friendship in three movements and shows the full range of the clarinet. It begins with a warm and welcoming allegro amabile – one imagines friends with hands outstretched to each other; then there is an allegro appassionato which is briefly fiery before ending with sad longing. Ultimately there is an andante con moto; allegro which is lilting; playful; gorgeous and should be much better known. Next was ‘Among Friends’ by Chinese-Canadian Ka Nin Chan who is currently on the music faculty of University of Toronto. It is a very complex piece with unexpected mood shifts and it requires virtuoso playing from all involved. It is the first time I have ever seen a pianist required to reach inside the piano to pluck a string for a harp-like sound or dampen one for a sad dull sound. The piece is meant to reflect the highs and lows of friendship and is at times atonal and at others harmonic, sometimes so playful one can almost hear the corn popping and at others quite doleful, but never boring. The audience knew they had heard something extraordinary and very difficult to perform and they loved it. 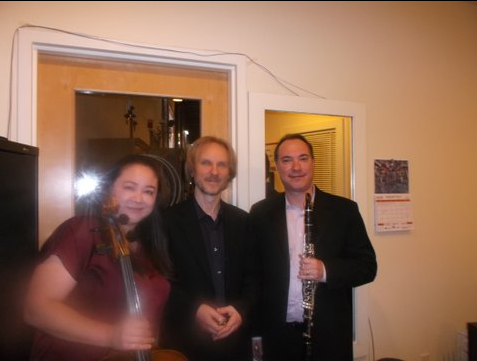 Following intermission the trio played Brahms Clarinet Trio in A minor. The overall mood, as with much of Brahms, is sombre but this piece also has romantic and introspective moments. Someone once wrote that ‘It is as though the instruments are in love with one another’. The cello opens the lush and rich Allegro movement after which there is a lot of interplay between the cello and clarinet which spans the entire range of the clarinet including many arpeggios. The dignified Adagio is harmonic and rhythmic’; the Andante grazioso is soft lilting and playful. This movement was not initially well liked as it was regarded as ‘unstable’ but it has stood the test of time. The final Allegro shows Brahms is definitely in control as he masterfully intertwines the cello and clarinet in a substantive, complex and very satisfying wrap to one of his last compositions. Definitely a lovely way to spend an afternoon with brilliant musicians and lovely music. The next concert is April 23rd, 2016 at 3pm at First Unitarian Church.